Last month on Twitter I asked for ideas of things to make, y'know just to mix things up. Anna said something with gold spray paint and Hollie said a hair clip for a wedding, both good ideas and Hollie I am working on the clip. Step 1. 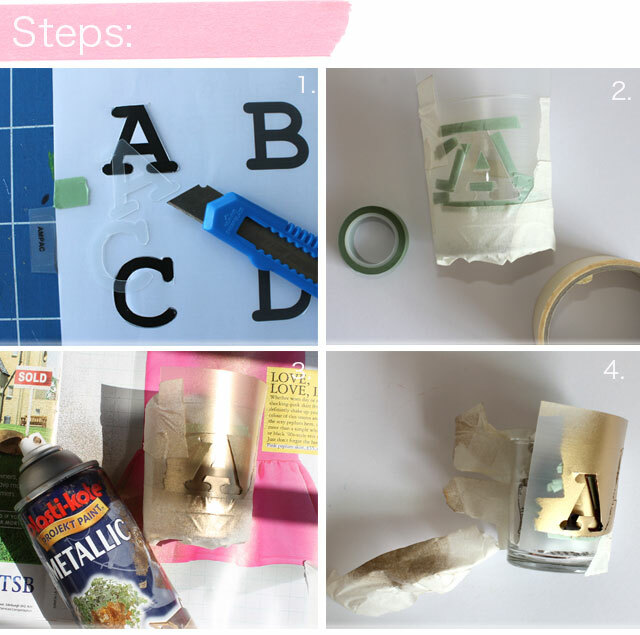 Place your plastic sheet over your letters and cut around with a craft knife. Step 2. Stick your letter to your jar using masking tape, I used a bit of washi tape along the small edges. You need all edges stuck down to give a clean edge. I also stuffed some newspaper in into the jar to protect the insides. Step 3. In a well ventilated spray your jar with spray paint. Do a couple of thin coats, making sure you leave to dry in between spraying. Step 4. Once dry remove the masking tape and paper. 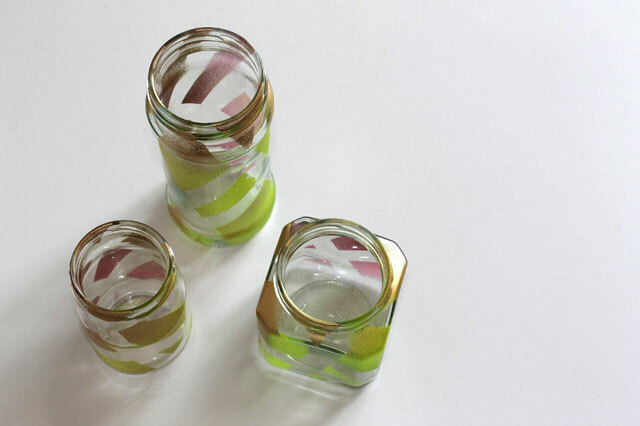 Whilst spraying the initial jars I decided to make these ombre ones too. 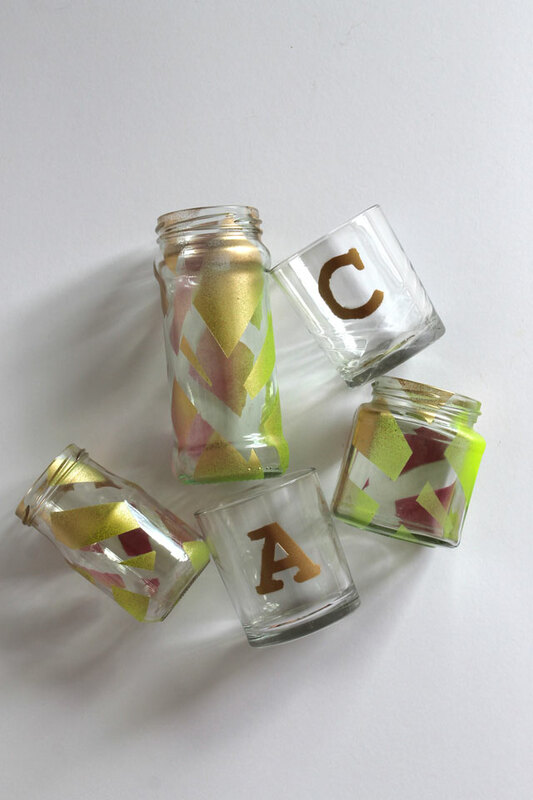 To make, I randomly stuck washi tape over some jam jars then sprayed with three different colour spray paints, left to dry and removed. I love how they are a bit sun-set-y. If I had a nice outdoor space/table I would have created a lovely summer scene but as I don't you'll have to use your imagination - think dahlias, tea-lights and a rustic table. 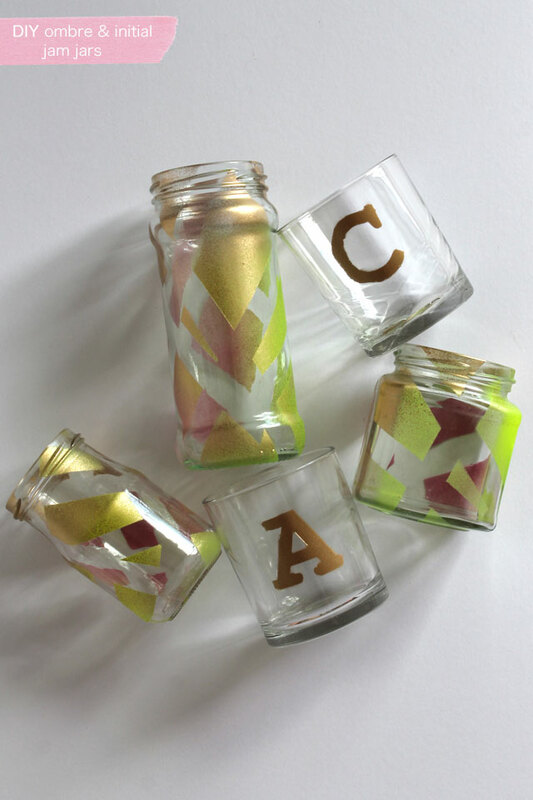 I really love these jars (the initial ones especially) I think they would be great at a wedding if you wanted to spell a few words or even at a classy hen party, you could fill with goodies for each of the guests. Another idea would be to make your own candles and give as a gift (the C word is slowly rearing its head), just make sure you put them into some of these!